Worn twice, this is a dazzling dress that has seen a trip to the oireachtas on its first outing.! The bodice of the the dress is a high gloss green satin, emerald in color. 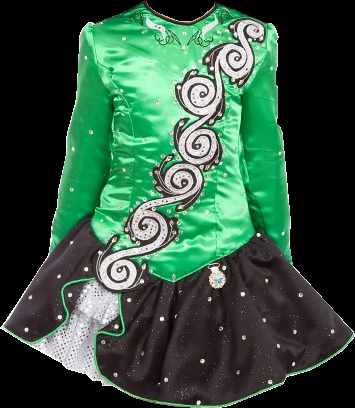 The skirt piping and detail is high gloss twinkle satin, giving it a star dusted shimmer. The swirl detail, the underskirt and the cape are all silver glitterball. The bloomers and the lining of the dress and cape are lycra in a luminous green with silver veins. The crowning jewel of this dress is over 500 oversized and diamond shaped crystals sure to catche the eye of the toughest judge! This dress is in perfect condition and all crystals are still in place. Headband is included.